The Postman Always Rings Twice is a 1946 film noir about a married woman and a drifter who fall in love, then plot to murder her husband... but even once the deed is done, they must live with the consequences of their actions. Directed by Tay Garnett. Written by Harry Ruskin and Niven Busch, based on the 1934 novel by James M. Cain. [to Madge Gorland] With my brains and your looks, we could go places. Cora: You won't find anything cheap around here! Look in the cupboard under the counter. Frank: [He looks and finds a can of paint] As my friend Nick would say, 'That's wonderful.' Next time anybody makes a trip into town, they can pick up a paintbrush. Frank: [voiceover] For a couple of weeks then, she wouldn't look at me, or say a word to me if she could help it. I began to feel like a cheap nobody making a play for a girl that had no use for me. While I disturbed her, and I knew she hated me for that worst of all. Frank: We've been double-crossed, Cora. That lawyer Keats, he's nothing but a police stool pigeon. Cora: I've been double-crossed, not you. Oh I see it all, now. I see why I had to drive the car, not you. And that other time, why it was me that had to do it and not you. Cora: Oh yes it is. I used to think to myself the reason I fell for you was because you were smart. Now I find out that you are smart. Double-crossed, hah! I'll say I was. You and that Keats fixed it up so that I tried to kill you too. That was to get you clear. And then you two fixed it up to plead me guilty. Well, listen, Mr. Frank Chambers. When I get through, you'll find out there's such a thing as being too smart. Frank: [after he and Cora are married] I can't remember that far back. Cora: As far as I'm concerned, you imagined it even then. Cora: Notice his neck-tie, Mr. Keats. It's my wedding present to him. But the way he wears it, you'd think it was a noose around his neck. Keats: [proposing a toast] Well, I can only think of fifteen or twenty reasons why you two should never be happy. Frank: [about the affair he had with Madge] That other girl. She don't mean anything to me. Cora: She told me you were going away with her. Frank: Why didn't I? I planned to and I'll never come back. Why didn't I go away and never come back? Cause we're chained to each other, Cora. Cora: Don't tell me you love me. Cora: Oh, but love wouldn't mean a thing to me. Frank: Do you hate me? Cora: I don't know. But we've got to tell the truth for once in our lives. Frank: [while driving] I've been waiting a long time for that kiss. Cora: When we get home, Frank, then there'll be kisses, kisses with dreams in them. Kisses that come from life, not death. Frank: I hope I don't wait. Sackett: Suppose you got a stay of execution, a new trial, and acquittal of killing Cora. Then what? Last night, they auctioned off the fixtures of the Twin Oaks. The man who bought the cash register found a note in the back of the drawer. He brought it to me. It's addressed to you. Cora wrote it. It's a very beautiful note, Frank, written by a girl who loved a man very much. I imagine it was written earlier the very night she died. A note of farewell, isn't it? Frank: She did try to run away that night. Cora: And since she had no idea anyone would ever see that note but you, it therefore has in it just enough of a confession to convict you of helping her kill her husband. So, if you were to leave this room because you didn't kill her, you'd soon be right back here again for helping her kill Nick. What's the use? Frank: Then, then what's gonna happen to me is not because I killed her? Sackett: No, laddie. For killing Nick. Frank: You know, there's somethin' about this that's like, well, it's like you're expectin' a letter that you're just crazy to get. And you hang around the front door for fear you might not hear him ring. You never realize that he always rings twice. Frank: He rang twice for Cora. And now he's ringing twice for me, isn't he? Frank: The truth is, you always hear him ring the second time, even if you're way out in the back yard. Lana Turner. 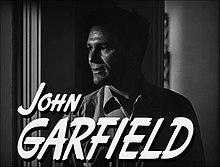 John Garfield. M-G-Marvelous!